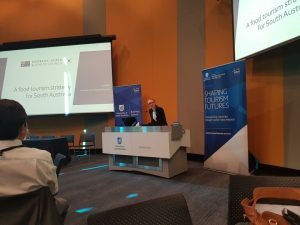 The University of South Australia hosted a ‘Food Tourism’ workshop to assist businesses develop cross-cultural understanding of food culture, agriculture and food tourism services in Australia and Korea. This forum aimed to create an interactive and valuable discussion platform for the tourism business sector so they can share their business cases and design practical steps to developing international marketing, product development, and potential business partnership strategies for food/wine tourism development, especially targeting Korean and other Asian tourist markets. 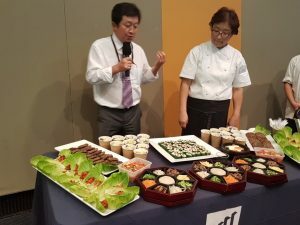 This event included 10 keynote presentations from major government organisations, Tourism Australia, Australia-Korea Business Council, Korea Tourism Organisation, Regional Development Australia and local/international food & wine tourism companies. It will be great beneficial for the industry to gain cutting-edge knowledge of Asian market development. Participants also had a great networking opportunity to interact with influential leaders from the government organisations, industry associations, food/wine tourism industry and academia from Korea and Australia. 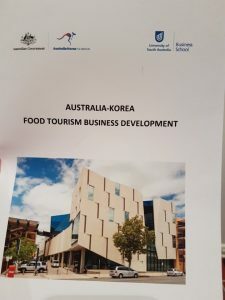 The ‘Food Tourism Business Development’ event was organised by the University of South Australia with support from the Australia-Korea Foundation.